They say imitation is the highest form of flattery but someone with good taste is better yet. My good friend Francisco Ortiz sent me this photo showing not only his new exhaust outlet on his BRE Datsun but a touch of California's Best class as well. Very Cool Francisco! 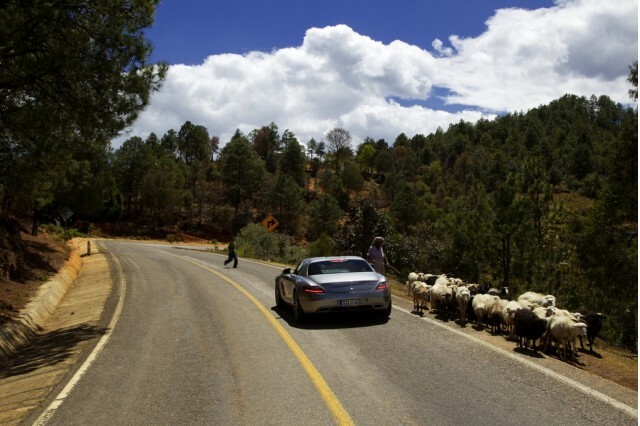 "As you round the bend, a single solid yellow line dividing the two-lane stretch of smooth, undulating blacktop stretched along the side of a Oaxacan canyon, you flick the right paddle to grab the next gear, rocketing forward on a wave of eight-cylinder sound, quickly moving to the brake, flicking the left paddle, a smooth turn-in, apex--don’t pause to marvel at the grip, no time--back on the gas, flick the right paddle, cactus and burros flashing by in your peripheral. For the next 50 miles." That's the way this very well written article begins. I especially enjoyed the part where the author says, "Then you snap back to reality, realize you’re just a journalist with delusions of grandeur, the Dodge Charger of the Federales running 140 mph ahead of you cutting a swath through the mountains to a waiting hotel, dinner and plenty of mezcal." As of March 21, 2010 Ayrton Senna would have been fifty years old. The following tribute to his is one of the best about one of the best drivers you'll ever see. For those who are wondering why I am bringing him up on a LCP site there is a special reason why. CLICK HERE TO FIND OUT WHY and be sure to listen to my friend Jo Ramirez. Star Named Ayrton Senna from Aldo Villamil on Vimeo. In light of the fact that the Mercedes Gullwings are attempting to recreate the race from years ago I thought it might be a good time to remind them about an event they might not want to reenact. 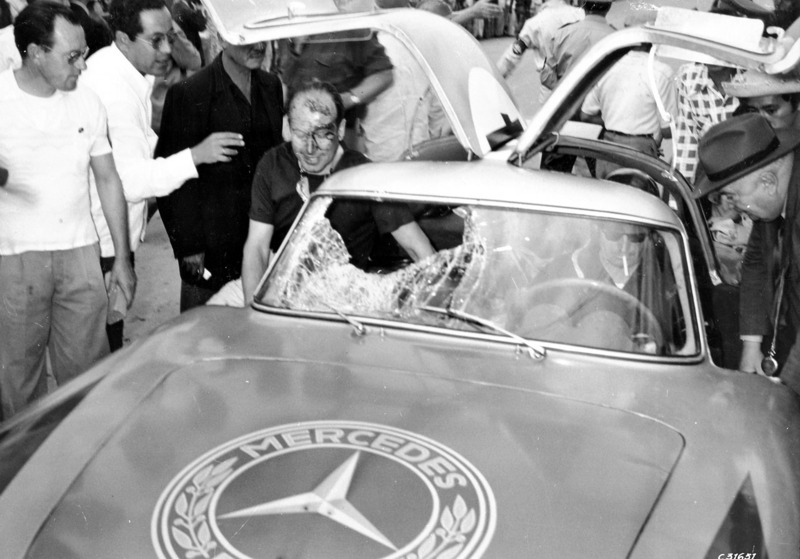 One of the most expensive crashes ever recorded in racing history took place in La Carrera Panamericana? 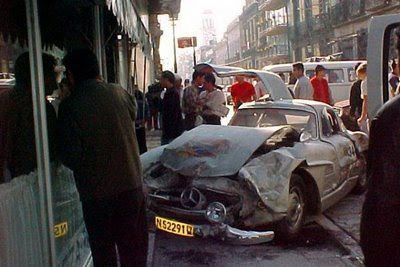 It was the Mercedes Benz SL 300 Gullwing pictured below. These cars are valued at almost a million dollars. The piloto of this car took on La Carrera Panamericana and lost. 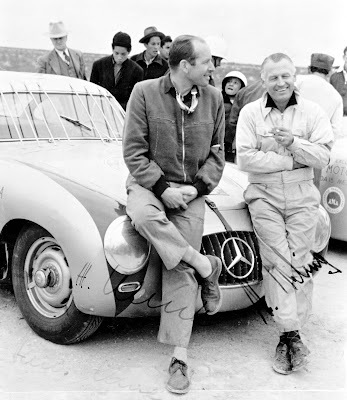 Retirement didnt last long as multiple winner of La Carrera Panamericana Pierre de Thoisy confirmed his participation in 2010 with a team of two Mercedes Benz Gullwing. 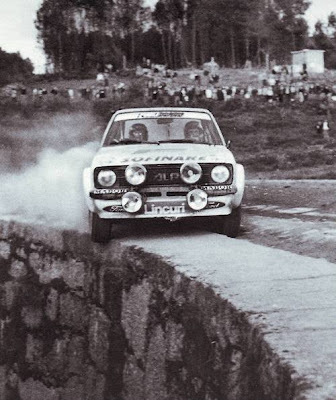 Once upon a time, long-distance road rallies were all the rage in motorsports. Sportscars raced down open roads across countries from sea to shining sea in spectacular form. But while two of the most famous took place in Italy – the Mille Miglia and the Targa Florio – another took place right here in North America. The Carrera Panamericana was held in the early 1950s in Mexico and was widely regarded as one of the most dangerous races in the world. 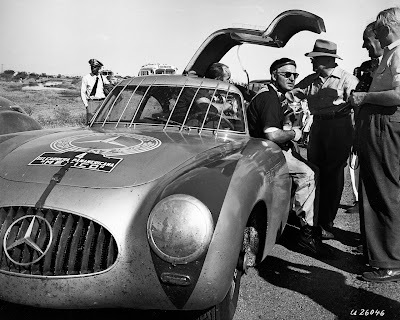 In 1952, Karl Kling and Hans Klenk took the checkered flag in a Mercedes-Benz 300 SL "Gullwing", but only after a collision with a vulture – yes, a vulture – heavily damaged the car and Herr Klenk's head in the process (hence the grille bars on the windscreen). To further cement the feat, a second Gullwing finished second, giving Mercedes a one-two finish. 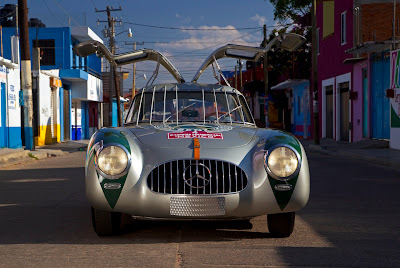 The race has long since been canceled, but like the Mille Miglia was revived recently as a classics rally, and the vulture-smashing original is to retrace its routes together with the modern Gullwing, the SLS AMG. Our man Paukert is doing just that as you read this and it should be a brilliant trip down memory lane. The initial crop of photos from the event are beginning to trickle in. See for yourself in the gallery below and scope out the details in the release below the fold. 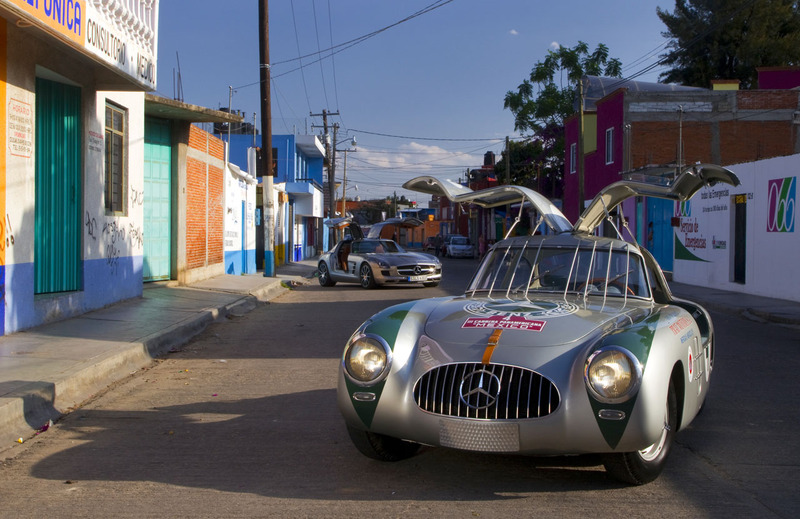 Stuttgart - The original winning car from the 3rd Carrera Panamericana Mexico in November 1952 is to return to the scene of its great triumph. 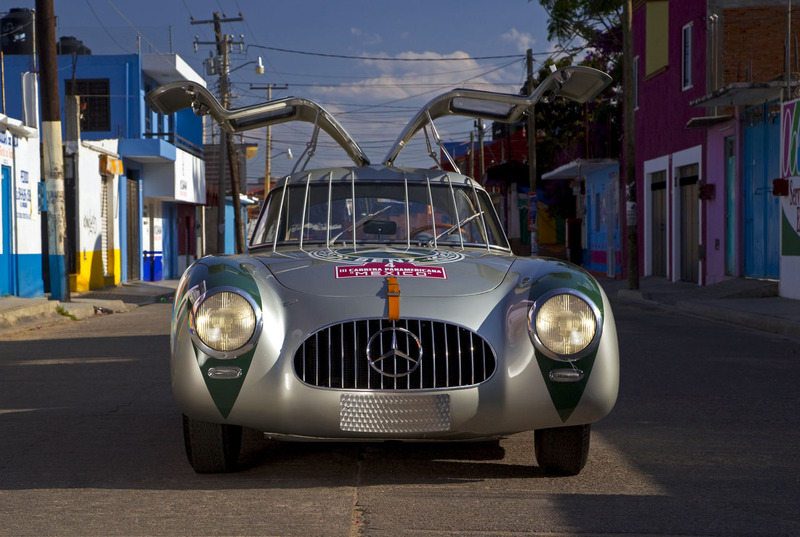 The 300 SL racing sport car (W 194) will temporarily be removed from the "Races and Records" display at the Mercedes-Benz Museum in Stuttgart, in order to join the Mercedes-Benz SLS AMG and set off once again along a part of the original route through Central America. 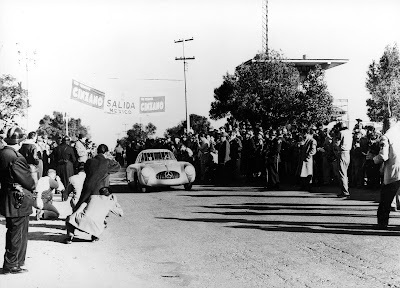 The 3rd Carrera Panamericana was one of the top international races of the 1952 season. The double victory achieved by Mercedes-Benz there ranks as one of the brand's most spectacular successes. Karl Kling and co-driver Hans Klenk won the race, a long-distance event covering 3111 kilometres, against strong international competition at an average speed of 165.011 km/h. Second to cross the finishing line, also driving a Mercedes-Benz 300 SL, were Hermann Lang and co-driver Erwin Grupp. Kling's collision with a vulture at 250 km/h, which left his car with a smashed windscreen and Hans Klenk with head injuries, went into the annals of racing history. 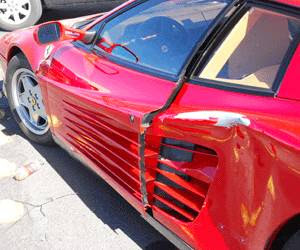 In addition to replacing the screen, the mechanics also immediately fitted eight thin vertical metal bars to protect vehicle and driver in the event of a similar collision – still the vehicle's most distinguishing feature. AMG has been producing racing versions of Mercedes-Benz cars and high performance street machines for over four decades. 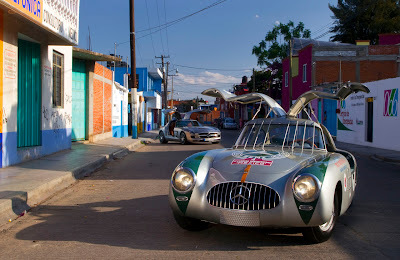 That tradition continues with the unveiling yesterday in Mexico of a GT3 spec version of the new SLS gullwing coupe. 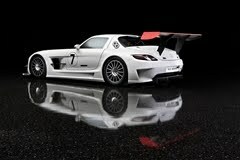 Sales will start this fall and AMG hopes to have the homologation process completed in time for the 2011 race season. 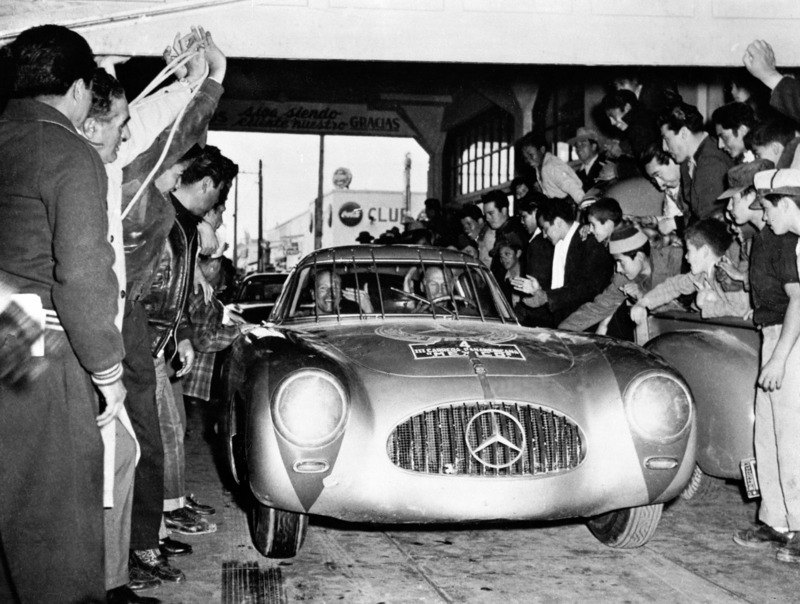 Given the racing heritage of the original SL from the 1950s, seeing a gullwing back racing on the track will be the best kind of déjà vu for fans of the three-pointed star ! 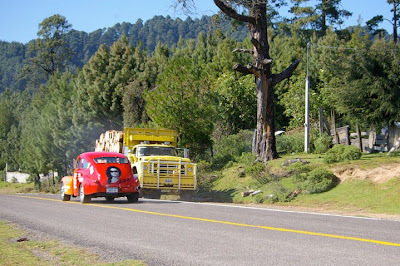 This is one of my favorite photos of the 2007 La Carrera Panamericana. It was taken by Johnny Tipler at the start of a speed stage on Mil Cumbre, a day I will long remember especially sice we won that stage. 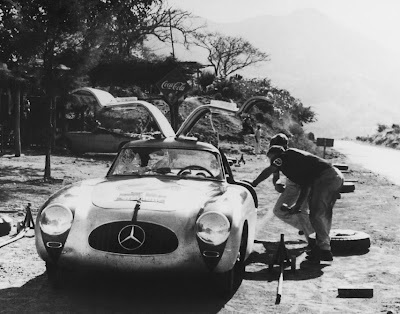 Yesterday I was telling Johnny besides loving the photo and what it means to me another thing I find interesting is that in the movie, La Carrera Panamericana - Rebirth Of A Legend, there is a scene where you can actually see Johnny shooting this exact photo which is easy to pick out because of the large dead tree in the background. "Yes that was pretty amazing. 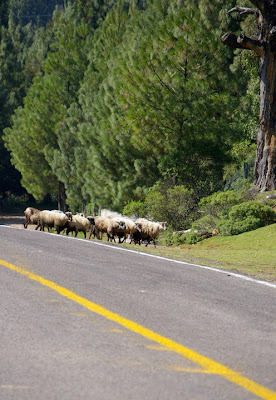 Around that time, not only did a flock of sheep wander across the road, but a timber truck lumbered out of the forest and came up the hill just ahead of where you are in the pic, he figured out something abnormal was going on and thankfully pulled on to the grass at the side!" WOW! I sure am glad I didn't know all that. I have no doubt that had I known it would have created some sort of hesitation in the corners to come... "Are there any more trucks. Did they get the road closed properly. How many damn sheep are in these mountains? I wonder how much damage a sheep will cause to my suspension if I don't lift?" The bottom line is just keep your foot to the floor and don't lift. Sure enough Johnny sent the photos to prove it. LOL. Thanks Johnny. You're the best! Proof that you should NEVER lift. 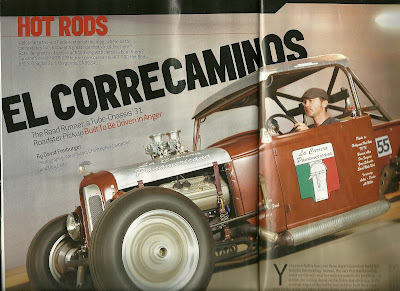 This months (May 2010) HOT ROD Magazine has two seperate featured articles about cars built specifacaly to compete in La Carrera Panamericana. Both cars are being built by our good friends Kevin Jones who ran an Unlimited Subaru with us in the 2007 LCP and then won rookie of the year at Pikes Peak. The other featured car is the design of Ron Lee who ran LCP in 2009. This is Kevin Jones Bad-Assed Chevy ll. 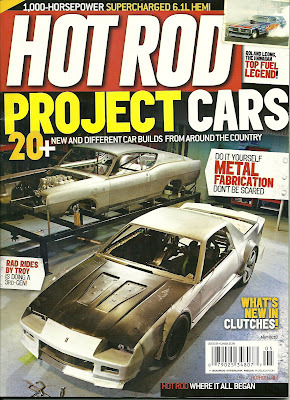 The article about Ron Lee's car is a full 7 page article about the car he brainstormed to imulate the famous LCP car built by AK MIller better known as El Caballo de Hierro. 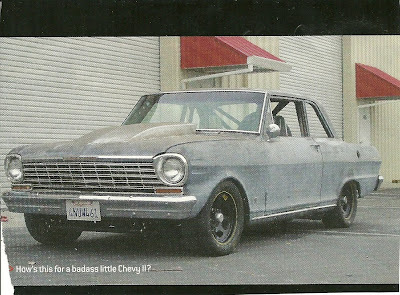 I saw this car at Rons home when it was in it's early stages and it's a first cabin project for sure. 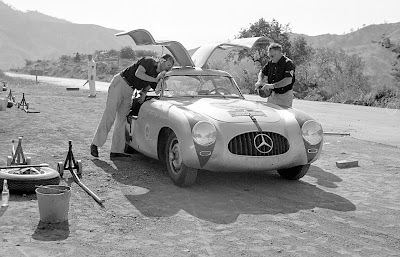 One of these days I am going to post sme NEVER BEFORE SEEN photos of AK Miller's car racing in La Carrera Panamericana that even Lee hasnt seen. Racing isn't always as glamorous as we hoped it to be. The most recent news from Chihuahua City is the piloto of the Porsche was released from the hospital although the co-piloto is in a drug induced coma and there is word that the piloto of the Renault has also been released from hospital. 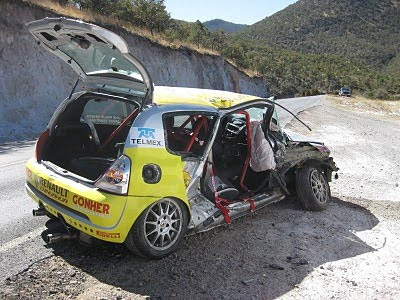 Early crash in 2010 Chihuahua Express. This years Chihuahua Express has been struck by lightning and it seems as if the only thing that came of good was how friends and fellow racers have pulled together when it was most needed. Each time we put on our gloves and helmets we need to realize just how fragile we really are and ask ourselves, how far past the edge are we willing to push. The 2010 Chihuahua Express has been canceled. 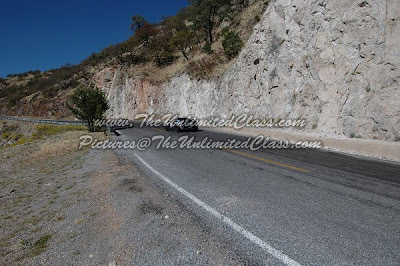 Today on the way back from Copper Canyon two Touring Class cars were involved in a serious crash on the freeway resulting in two fatalities in a Corvette and two in a Porsche were medivaced to the hospital. Sketchy reports say this was after the rally on the way back to the Hotel on a open freeway/toll road. Witness say these two cars passed them on the toll road going 150 mph plus and it was very windy. The piloto and co-pilotos of the Corvette were Heberto García and Nanán Solana. Nanán Solana was the brother of the legendary Mexican driver Moises Solana. 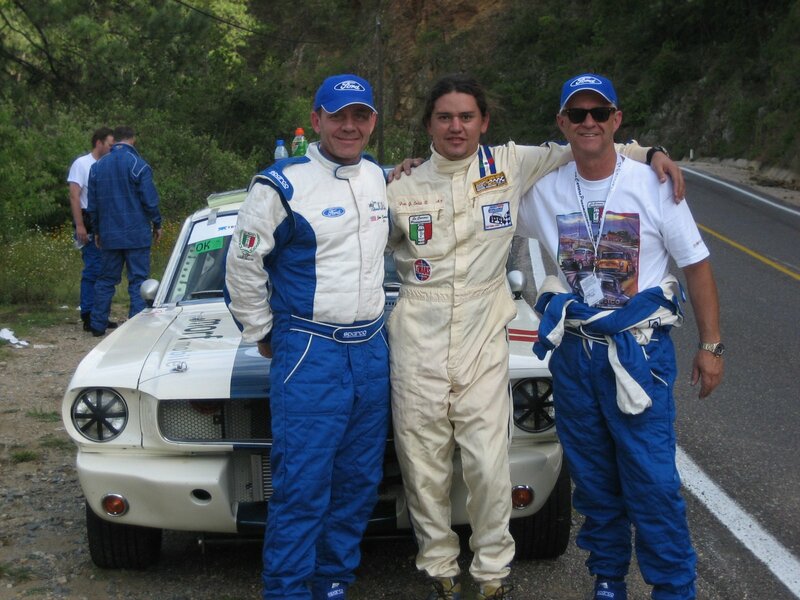 The other car involved was piloted by Luis Angel of Brena and Gerardo Arevalo. Touring Class cars are not required to have roll cages, etc and are not supposed to race and are required to obey all speed limits. It's a long transit back to the hotel and there is some speculation that they may have been racing each other back to the event hotel in Chihuahua City. Truly a sad day for Mexico, for their family and friends and for racing. God speed to those who are gone and our thoughts and prayers are with those in the hospital and their loved ones. 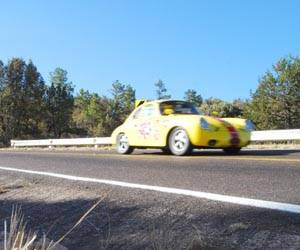 Our friends in a yellow 356 Porsche spun at the same place where yesterday's crash took place and there was light colored sand/dirt on the road. Here are some photos my good friend Bret Haller took and a note from him. Here are 2 pictures of where the crash happened. 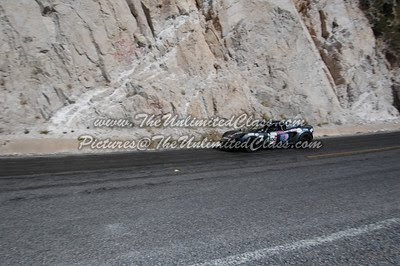 (my pictures are on the return, with the cars going up the hill ... but are exactly where it happened) ... they were coming down the hill in the accident .. there is clear visibility there, they were probably just going too fast or something broke in the suspension. 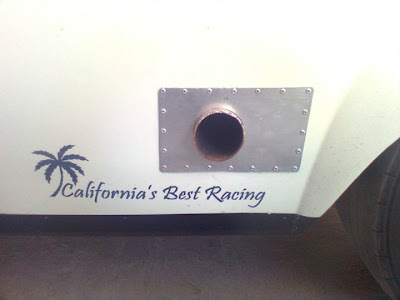 Team California's Best Racing would like to offer our sincere condolences to the family and friends. Here is the most recent report via Kristen's WTF blog on the terrible event that took place during yesterday. 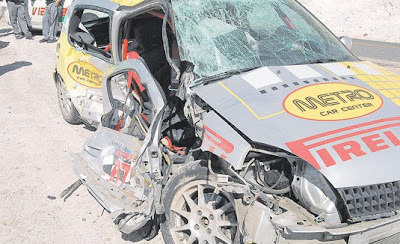 The copilot of a late model Renault Clio died in a crash on a speed stage today. I can't put words to this. According to the race director, Chaco Medina, excessive speed was the cause. It was a steep downhill section in the mountains this morning, about 25km into the stage, and from what we saw passing by about 45 minutes after the crash, it appeared that they bounced off a rock wall/cliff on the left hand side, crossed over to a dirt turnout on the right and t-boned two spectator cars. 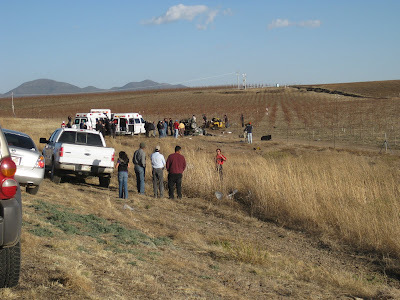 No spectators were injured but the copiloto, Carlos Garcia A. of Mexico passed away. Rest in peace. The car was numbered 67 on the door but listed as 68 on the roster. 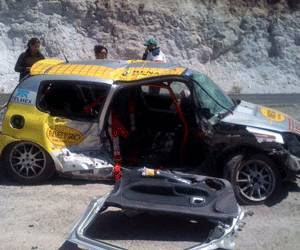 There were two yellow Clios - this one had "Metro" on it and we do know that the other yellow Clio - a Euro Latino car driven by Juan Jose Stanglemaier was not involved in the crash. Tom reports a crash yesterday by one of the three Renaults which hit two parked spectator cars and rumored to have resulted in a serious injury to one of the racers . 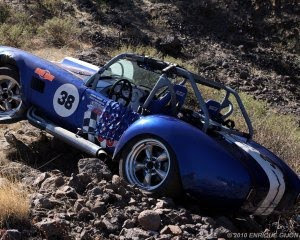 Also a cobra had a slight off but is back in the rally and Brad Kaplan's Lincoln had over-heating problems. 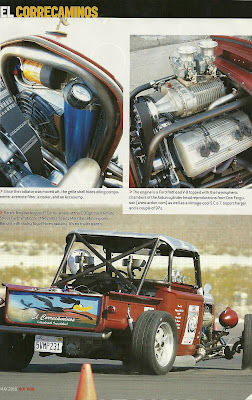 John Gregory's Studebaker lost overdrive. The teams are now on their way to Copper Canyon. 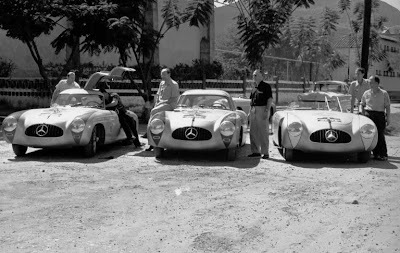 Things are taking a fast turn for the worse especially at the border and this is a very important situation for all La Carrera Panamericana and Chihuahua Express teams. At this very moment we have many friends who are racing even as I type this and as soon as I hear anything I will post it. 145 miles west of Presidio, Texas. CLICK HERE to read about armed gunmen blocking roads. THREE horrendous killings occurred recently in Ciudad Juarez, Mexico, just across the border from El Paso, Texas. They underlined the severity of the influence of drug cartels in Mexico, but also sounded a warning to Americans. Shot dead were an employee of the U.S. consulate general, her husband, and the husband of another U.S. employee. What was new was not the execution-style killings, but that these were the first American government officials to have fallen victim to them. The spreading poison of the cartels in Mexico, which cause some observers to fear that the country of 112 million people is becoming a drug culture, is alarming to Americans. One reason is the historically close relationship between the United States and Mexico. A second reason is that there are many Mexicans in the United States, who have both legal and illegal status. And third, although maintaining law and order in Mexico is clearly the business of the Mexican government and not the United States, the fact is that Mexico's drug cartels' existence depends on the hungry market for their product on this side of the border. The basic relationship between the United States and Mexico will remain in spite of the drug trade and its corresponding slaughter, which has spread from Mexicans to Americans. While there is grumbling in the United States about the impact on jobs here as a result of the 1994 North American Free Trade Agreement, nearly half of Mexico's $140 billion worth of imports last year came from the United States. Mexico was the second-largest destination for American exports, behind only Canada, the other partner in NAFTA. In spite of U.S. efforts to control the nearly 2,000-mile border with Mexico, it remains porous. The idea of building a fence and wall along the border was abandoned recently because it is not the most effective method of addressing the problem. U.S. aid to Mexico through the Drug Enforcement Agency, the Federal Bureau of Investigation, and the Immigration and Naturalization Service is intended to improve coordination, to tighten border procedures, and to control the trade in arms across the border. President Obama is reportedly considering an increase in aid in the aftermath of last weekend's killings. President Felipe Calderon of Mexico is using the Mexican army to curb violence along the country's northern border. U.S.-Mexican military cooperation has too sensitive a history to offer much promise. Probably the best action the U.S. government could take to help alleviate the drug cartel problem would be to modify America's own drug policy. The problem is twofold: the supply of product from Mexico and demand for it from the United States. It is a matter that cries out to be addressed from both ends. The official route of the Pan Am 2010 has not been officially announced, but it is expected to be Tuxtla Gutierrez, the traditional start of the event, down in the tropical part of Mexico. Tuxtla is a modern city of around 600,000 in the southern state of Chiapas. It is also expected that the race will circumvent the nation’s capital, Mexico City. The dates are firm: 22-28 October. The ending city is expected to be Nuevo Laredo, across the border from Laredo, Texas. The deadline for the discounted entry fee of $6,000 is April 30. Last year the deadline was February 28. After April 30, the entry fee goes up $500. The entry fee covers the racecar, driver(s), navigator(s), support crew, and provides eight nights of a double (two beds) hotel room in four or five star hotels. The driver and navigator also receive a racing jacket, plus other souvenirs. 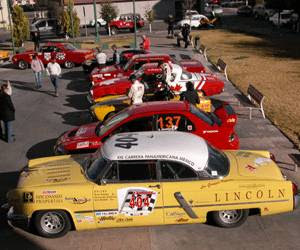 Once the fee is paid, the application complete and accepted, each entry will be posted on the official web site www.lacarrerapanamericana.com.mx. Sometimes we must wait for photos of cars being fabricated for the event. 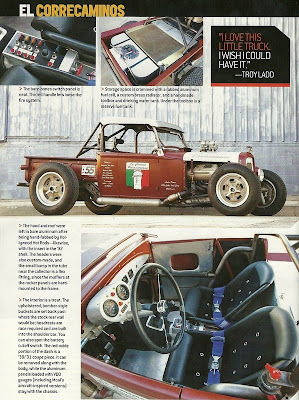 Owners of cars being built for the Pan Am should have the design for their roll cage reviewed. 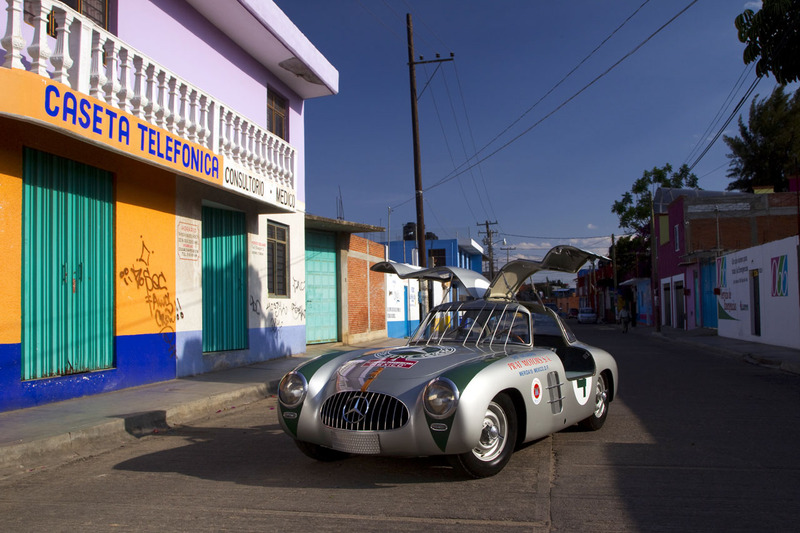 For the past few years the Pan Am has had a great reception in Querétaro. Thousands turned out in the main square on Sunday afternoon to take photos, collect autographs, and view the cars--all under sunny skies. Querétaro lies at 6,078 feet in altitude and is about about 2.5 hours north of Mexico City on Highway 57, the main north-south highway in Mexico. The population of the metro area is 825,000. Like most of these old colonial cities, it has a beautiful, historic downtown. It’s been designated a World Heritage Site. Querétaro is famous for its opals and other gems. It is now a major industrial center. Passenger flights in and out of the city, however, are somewhat limited and expensive. 1. Entry Fee. The fee covers any number of driver(s), co-driver(s) and the car. Competitors may reserve one of the thirty places allocated to North America (Canada and the U.S.) for a non-refundable deposit of $500, but then pay the total fee due at the time of their final payment. 2. Rally license. 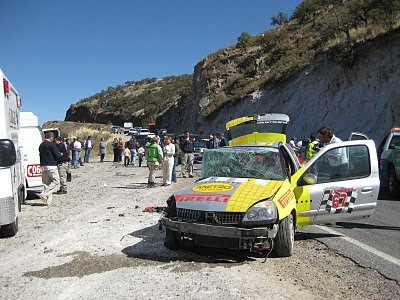 All drivers and navigators must purchase a Mexican rally license. It will cost $300 USD. The license includes a modest amount of medical insurance. Drivers and co-drivers will be given a quick but free medical exam before the race. Contrary to what the rules say, it seems that one does not need to have a racing license from their country to acquire the Mexican license. However, racing experience, training, and practice are highly recommended. 3. Mexican Car Insurance. Competitors must provide proof of insurance upon registration on their service vehicles. The cost usually runs between $12-25 a day. There are several vendors, including www.bajabound.com, that broker these policies. 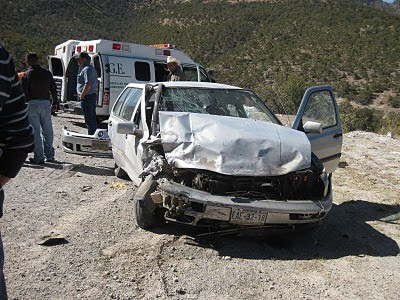 Mexican insurance coverage works just like insurance in the USA. Having liability insurance on the racecar is also recommended, but not required, if there are plans to test it before the race begins. Insurance coverage would not be valid while the car is in competition, of course. 1. Each entry—posted in the name of the car’s principal driver--will receive one double room (two beds) for eight nights (Oct. 21—28) at four/five star hotels at the starting city and along the route. Usually the driver and co-driver share this room. Having private rooms is also popular with modest guys. Once the pre-registration process is complete (the entry fee has been paid and the application form is finished), competitors may make hotel reservations with Monica Grossmann in the Carrera Office Mexico City. The best way is to email her at monica.grossmann@yahoo.com.mx. Monica is the business officer for the race and the wife of the organizer, Eduardo Leon. Interested parties may also call a U.S. telephone number 01-310-860-6950 to reach the office. Please note that once the hotel rooms are paid, one cannot receive a refund or transfer the rooms to another crew. 2. Additional hotel rooms are usually $150 a night for regular hotels. Luxury hotels in some cities are sometimes available for $150 more ($300 total per night). Some of the luxury hotels fill up fast because they are very small. Most competitors and their crew members will arrive two or three nights before the event starts, so they must pay $150 for the extra nights or make other arrangements. An extra room usually costs $1200 for the eight nights of the race in the regular hotels. Most drivers stay in the same hotels as their crews, because it is far more convenient at night to service the racecar. If one car’s crew wants to stay in the same hotel as another crew, please make this clear to Ms. Grossman, as the competitors are sometimes assigned to as many as four or five hotels in the same city. The expense for food and beverage varies enormously with individual budget, taste, and selection of restaurant. One may eat very cheaply in Mexico, or pay hotel prices, which are somewhat less expensive than Europe or US. Most people budget about $60 a day for food, but some hotels will charge $25 just for the buffet breakfast. The fall in the value of the peso will help in this category. It is currently around 12.66 peso for one U.S. dollar. PEMEX gasoline costs $2.60-2.80 a gallon. Plan to pay in pesos, but more stations are accepting credit cards. The race covers normally around 1960 miles -- say 2000 -- counting wrong turns and side trips. Diesel fuel is generally available, but it is the old-fashioned high-sulfur kind. Tuxtla Gutierrez is around 1400 miles from Laredo, Texas. Importing a car on a temporary tourist permit costs $35 (at the border or consulate) or $60 on the Internet (credit card only). 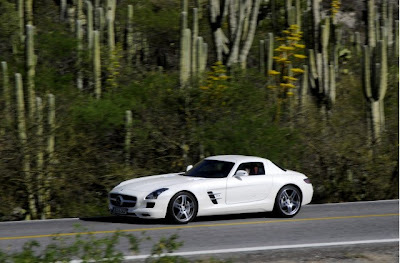 Importing a car with the services of a Mexican customs broker will cost $300-1200. This fee is highly negotiable. 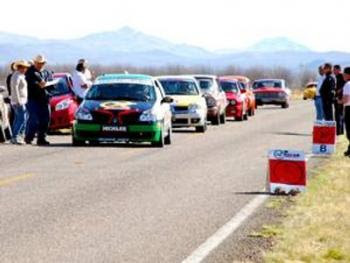 A special arrangement in Nuevo Laredo for the Coyote Convoy will be offered. A customs broker is recommended if (1) all the owners of the vehicles are not present at the border or (2) the team is carrying a lot of pare parts, extra tires, engines, etc. From California or Washington State, shipping on a transport truck down to Mexico and back to the truck’s headquarters runs around $5,000. Unfortunately, there is no truck coming (yet) from the Midwest and east Coast. Most Europeans ship their cars to the port of Vera Cruz. Others ship their cars to an American port (Houston or New Orleans) and drive or tow them down. Tow trucks may be rented in Texas. 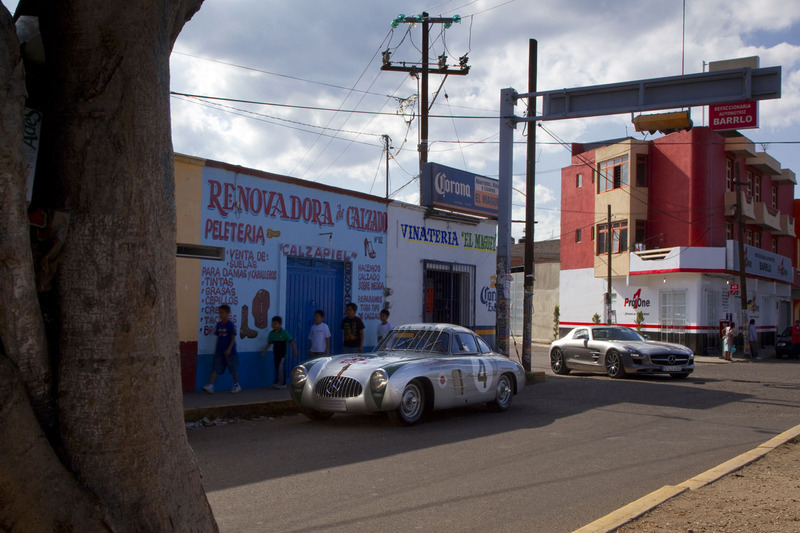 Competitors may arrange mechanical support in Mexico for $1500-3000, or they can pay local mechanics by the hour. Some of the transporters will provided mechanical support for an additional fee, of course. Towing within Mexican can also be arranged. One team of Mexican mechanics and welders usually follow the race. They will repair cars on a retainer basis or by the hour. There is no cost for participating in the convoy except for the hotels along the way and any group meals. As last year, a HANS devices or other approved (FIA/SFI) head and neck protection system will be required in all classes this year.